The STeLLA professional development program engages fourth-, fifth-, and sixth-grade teachers in using two powerful and often neglected lenses to analyze videocases of science teaching: the Student Thinking Lens and the Science Content Storyline Lens. 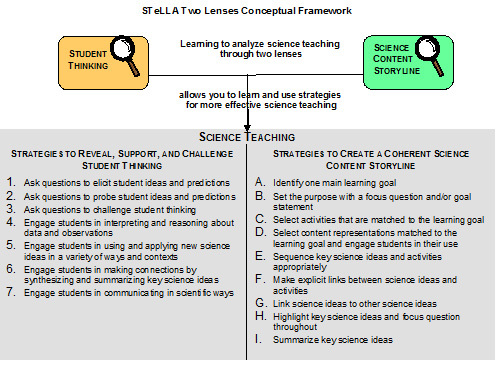 Focusing on deep analysis of these two lenses and associated teaching strategies, teachers learn to be more analytical in planning, enacting, and reflecting on their practice. Through this analysis work, they deepen their science content knowledge, develop as analytical practitioners with rich pedagogical content knowledge about the subjects they are teaching, and improve their planning and teaching practices. Most importantly, the one-year intensive program improves their students’ science learning. In short, this is a professional development (PD) program that makes a difference in terms of student learning. Funded by the National Science Foundation, Biological Sciences Curriculum Study (BSCS) is now testing the scalability of this innovative professional development program in an even more rigorous study. The five-year research study is testing the effectiveness of the STeLLA PD program when it is scaled to (a) reach larger numbers of teachers (150) and students in a wider array of settings, (b) include random assignment to two treatment groups, and (c) be delivered by professional development leaders who were not program developers. The preliminary results from Cohort 1 show results similar to those in the initial study in terms of both teacher and student science content learning. You can go to http://vista.bscs.org to read about and explore an online version of the STeLLA PD program, called BSCS Videocases for Science Teaching Analysis (BSCS ViSTA). The five BSCS ViSTA modules (electricity, force and motion, inquiry, plants, and water cycle) provide rich videocases of K–8 science teaching and learning. The modules are structured around a sequence of analysis tasks and short associated readings that introduce teachers to the Student Thinking and Science Content Storyline Lenses and associated teaching strategies, and that engage teachers in using these conceptual tools to analyze the videocases. In addition to videos from classroom lessons and interviews with students and teachers, the videocases include lesson plans, written student work, student pre-posts, and any other materials used during the videotaped lessons. BSCS provides support services for PD providers who are interested in using these materials in either face-to-face or online contexts. The STeLLA and BSCS ViSTA programs were developed and studied by funding from the National Science Foundation (#DRL-0918277 and #DRL-0957996 respectively). Any opinions, findings, and conclusions or recommendations expressed in this material are those of the author(s) and do not necessarily reflect the views of the National Science Foundation. For additional information about the online BSCS ViSTA program and facilitation services available, contact Paul Numedahl (pnumedahl@bscs.org). For information about the STeLLA PD program, contact Kathleen Roth (kroth@bscs.org). For information about the STeLLA research study, contact Joe Taylor (jtaylor@bscs.org).